The 'warming trend is obvious and continuing,' WMO chief Petteri Taalas told reporters in Geneva. Other tell-tale signs of climate change, including sea level rise, ocean heat and acidification and sea-ice and glacier melt continue, whilst extreme weather left a trail of devastation on all continents. 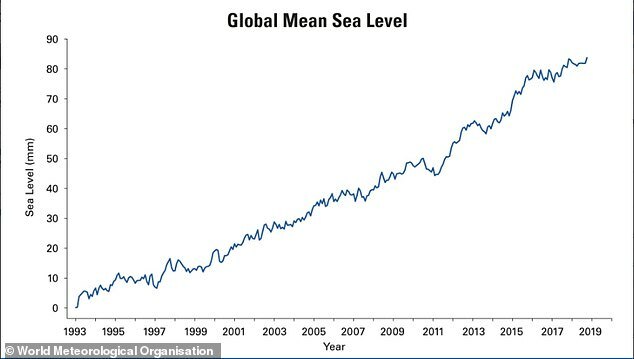 Figures released by the WMO showed that the planet was nearly 1C (1.8F) above pre-industrial levels for the first ten months of this year. 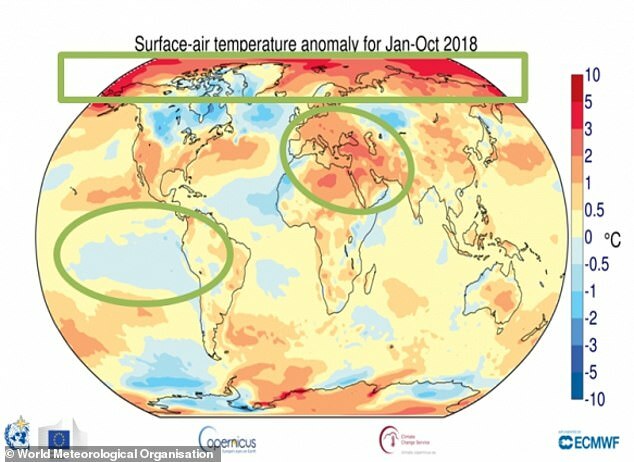 The temperature for 2018 was recorded from five independent data sets. If these trends continue temperatures could rise by as much as 3.5C (6.3F) by 2100, researchers warn. It hopes to hold the increase in the global average temperature to below 2C (3.6F) 'and to pursue efforts to limit the temperature increase to 1.5C (2.7F)'. 'We are not on track to meet climate change targets and rein in temperature increases,' said Mr Taalas. 'Greenhouse gas concentrations are once again at record levels and if the current trend continues we may see temperature increases 3.5C (6.3F) by the end of the century. 'If we exploit all known fossil fuel resources, the temperature rise will be considerably higher,' he said. 'It is worth repeating once again that we are the first generation to fully understand climate change and the last generation to be able to do something about it,' said Mr Taalas. 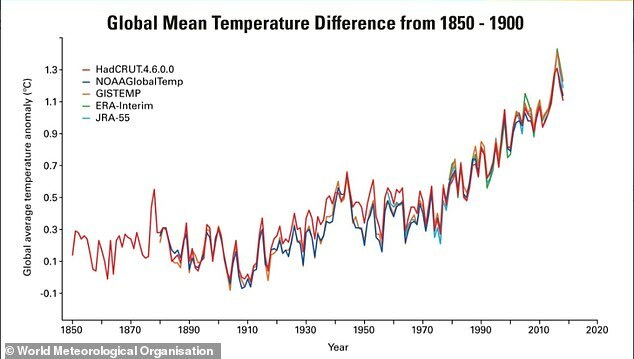 The Intergovernmental Panel on Climate Change (IPCC) special report on Global Warming of 1.5C (2.7F) reported that the average global temperature for the decade 2006-2015 was 0.86C (1.54F) above the pre-industrial baseline. 'These are more than just numbers,' said WMO Deputy Secretary-General Elena Manaenkova. 'Every fraction of a degree of warming makes a difference to human health and access to food and fresh water, to the extinction of animals and plants, to the survival of coral reefs and marine life. 'It makes a difference to economic productivity, food security, and to the resilience of our infrastructure and cities. 'It makes a difference to the speed of glacier melt and water supplies, and the future of low-lying islands and coastal communities. Every extra bit matters,' said Ms Manaenkova. The WMO report adds to the authoritative scientific evidence that will inform UN climate change negotiations at the COP24 summit from 2-14 December in Katowice, Poland. The IPCC report on Global Warming of 1.5C (2.7F) said that this target was physically possible but would require unprecedented changes in our lifestyle, energy and transport systems. It showed how keeping temperature increases below 2C (3.6F) would reduce the risks to human well-being, ecosystems and sustainable development. A UK assessment published on 26 November warned summer temperatures could be up to 5.4C (9.7F) hotter and summer rainfall could decrease by up to 47 per cent by 2070. 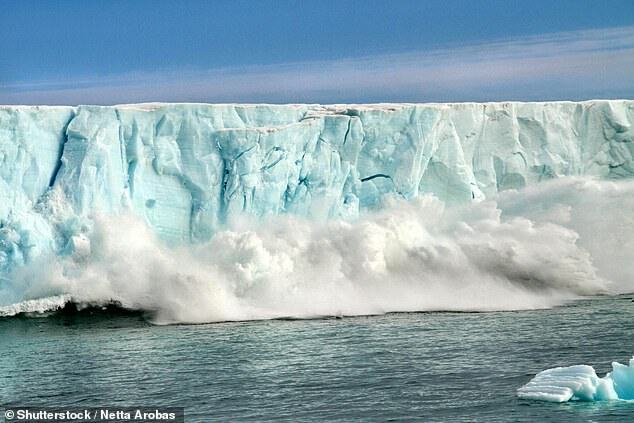 Sea levels in London could rise by 3.8ft (1.15m) by 2100. This year started with a weak La Niña event, which continued until March. By October, however, sea-surface temperatures in the eastern Tropical Pacific were showing signs of a return to El Niño conditions, although the atmosphere as yet shows little response. If El Niño develops, 2019 is likely to be warmer than 2018, scientists say. Arctic sea-ice extent was well below average throughout 2018 with record-low levels in the first two months of the year. The annual maximum occurred in mid-March and was the third lowest on record. The number of tropical cyclones was above average in all four Northern Hemisphere basins, with 70 reported by 20 November, compared to the long-term average of 53, leading to many casualties. 'The evidence, if we needed any more, continues to stack up', said Greenpeace's Head of Delegation Jens Mattias Clausen. 'The record-high heatwaves, record-low Arctic sea ice, above average tropical cyclones and deadly wildfires are an alarm bell impossible to ignore. 'We're in the midst of a climate crisis and this meteorological report spells out the worsening threat in startling clarity. It's no longer our future that is in peril; our today is at risk', he said.